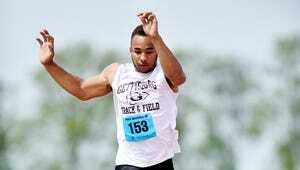 Ravaughn Dillard broke Darnell Johnson's Gettysburg triple jump record last week. Now he looks for another PIAA medal. Darnell Johnson's phone kept lighting up late Friday morning as word spread that his Gettysburg High School triple jump record had fallen at the District 3 track and field championships. Johnson's cousin Ravaughn Dillard won the district title with a leap of 47 feet, 11 3/4 inches, edging Johnson's record by three-quarters of an inch. 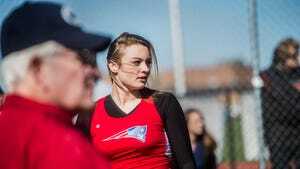 It was a familiar feeling for Johnson, the 2005 Gettysburg graduate who won a state triple jump title in 2004. This time last year, his phone also was lighting up with text messages and Facebook posts from family and friends. Dillard had tied the record — right down to the half inch — with his title-winning jump at the 2015 PIAA championships, matching Johnson's title-winning leap on the same Shippensburg field 11 years earlier. Dillard's record-setting jump last weekend starts to separate him from Johnson, as the two have been tied together for the past year by more than just blood. Another medal this weekend in Shippensburg, where Dillard is the favorite to win his second straight PIAA Class AAA triple jump title, will continue to push Dillard into his own realm in both family and Gettysburg lore. For the past year, records have tethered Dillard and Johnson together even further. Earlier this season, Dillard also tied the Gettysburg long jump record of 22-4, held by — guess who — Johnson. A year ago, Dillard wasn't even aware that Johnson excelled at track and field. Dillard lived in Harrisburg during Johnson's heyday at Gettysburg and was too young to remember much about it. But when he matched the record and saw who held it, everyone started comparing the cousins. But the biggest similarity isn't the success they share so much as how they got there. Neither cousin grew up competing in track, as Johnson grew up playing football and Dillard grew up playing basketball. But their athleticism translated quickly when they joined the track teams. Johnson won his state title in his first year competing in track, and Dillard won his state title in his second. After he graduated from Gettysburg, Johnson joined the track and field team at the University of Miami, then transferred after one year to play football at Millersville University. Now he works for an insurance company in the Philadelphia area. The Class AAA triple jump championships will take place this Friday, starting at 9 a.m., while Johnson will be on his way to Ocean City, Md. for an annual Memorial Day weekend vacation with friends. He'll be paying close attention to his phone, waiting to see whether or not Dillard earns another title.